A little time outdoors – be it in your own backyard or at the beach – can do a world of good for you and your little ones; after all, who wants to miss all the sand and sea-breeze in the height of summer? The fresh air and activity is revitalizing to anyone of any age, but there’s a catch – the sun. Over-exposure to harsh ultraviolet rays is attributed to a wealth of skin problems and other ailments, and this is especially dangerous when it comes to the delicate skin of babies. So how do we give kids both the time they need outdoors as well as shield them from all those UV rays – or at least keep them safe and sheltered while we kick back for a tan? Our answer is – beach tents. The tent pops into shape when you zip it down without requiring any complex assembly, and is just as easy to pack away when you’re done using it. The best part, though, is that it comes with a Sun Protection Factor (SPF) of 50+ – capable of blocking out close to 100% of all UVA and UVB rays. The tent also comes with a clever little mini-pool which can be detached when you need to fill it up or empty it, perfect for toddlers to play and cool down in the yard on hot summer days, or to keep occupied as the adults take a splash at the beach. The contraption is decked out with sturdy Velcro and two-way zippers to help you secure the whole thing into place and fold it up when you’re done using it, with a convenient carry bag included to tuck it into. There’s a mesh screen and curtain included which you can use to discreetly check up on your little ones without interrupting their play-time, while still shielding them from the sun. Space-saving and lightweight, it’s easy to store away during colder months or squeeze in amongst your beach supplies for a summer getaway. 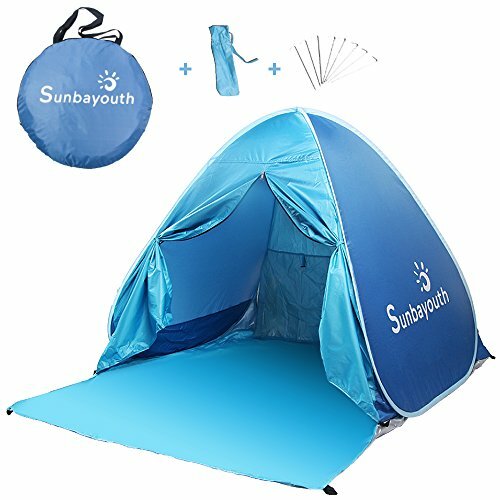 Doubling as a portable play pen to keep your child safe and happily preoccupied with a few toys, this SPF 30 tent is ideal for both indoor and outdoor use, blocking up to 97% of UVB rays. 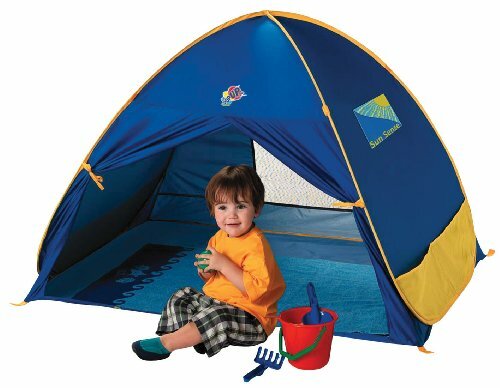 The soft polyethylene floor is as comfortable as can be for your toddler to roll around or nap in, the tent itself perfectly convenient to change your baby’s diapers or clothes when you’re out at the beach, in a park or camping. Mesh screens at either side of the tent provide both visibility and ventilation, the mesh door capable of being closed with Velcro attachments to keep your kids out of trouble while still providing plenty of space to let them play about to their heart’s content. The tent is highly durable and simple to set up, held together by two shock-corded poles, the polyester construct of the tent itself tear- and wear-resistant as well as flame retardant. Keep your little ones cool and safe in these tents when you’re visiting friends or family, heading to the beach or having a picnic, packing it up in its space-saving carry bag when you’re done using it. 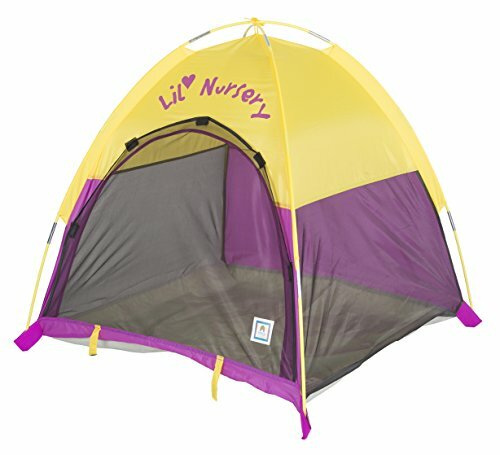 Promising 90% protection from UV rays, this roomy tent is big enough to let you breastfeed or change your baby in complete privacy, offering plenty of room to keep your little ones to play around out of the sun and away from any creepy crawlies that might otherwise get at them outdoors. With a front door system you can zip down when you need to, you can simply roll up the upgraded shutter to leave the mesh screen open, letting you keep an eye on your kids while keeping the sunlight, errant breezes and bugs out. The eco-friendly material of this tent is lightweight and highly portable, compact enough to let you fold up and stow into your luggage, but comes equipped with sand bags and metal stakes to help you secure it without the fear of the tent becoming unstable in windy weather. Great for both indoor and outdoor use, the weather- and water-resistant design and spacious interior of the tent also makes it ideal for use when camping. The pop-up design of this tent takes the hassle of assembly out, armed with sand weights and tie-down pegs to help secure it in place in case it gets windy. 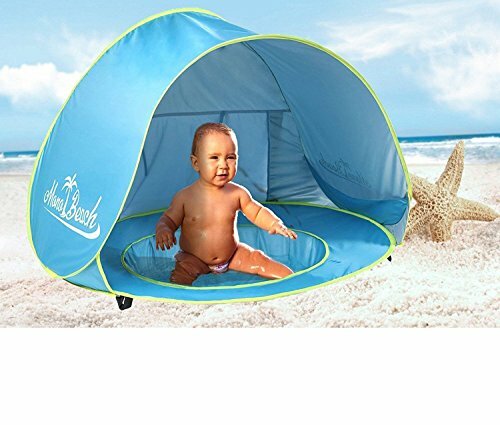 With SPF 50+ construction, you can rest assured that your little ones are perfectly safe from UV rays inside this bright, jolly looking tent, big enough for more than one baby snoozing through a sunny afternoon at the beach. A mesh-screen window at the back of the tent is accessible if you roll up the shutter, letting you peek in on your kids every once in a while, while also ensuring the tent is perfectly breathable. The water- and weather-resistant polyester makes it both a soft, comfortable material for kids to play around in as well as highly durable and resistant to whatever the elements – or your kids – have to throw at it. The beach and the sun seem to go hand in hand, but when it comes to the UV rays pouring down along with that warm sunlight, we’ve got a problem on our hands. Beach tents offer a simple but effective solution – keep your toddlers out of the way of the many possible dangers of beaches, from uneven sand to broken bits of sea-shells to wading too far into the ocean, while also protecting them from the fierce rays of the sun. Look out specifically for UV-resistant tents – the best options clock in between SPF 30 and 50, promising to keep out as much as 97% and more of UV rays. Tents, while ideally lightweight and easy to assemble, should also come with pegs, straps, and weights to help keep them stable if it gets windy – as well as being waterproof, since we are, after all, talking about being by the sea. Polyester is a great water-resistant material to consider, soft and safe for kids to be in and around. Also look out for tents equipped for proper ventilation – tents which come with mesh screens that can be closed off with roller shutters or Velcro-sealed curtains are perfect to keep out errant sunlight while still ensuring ventilation and letting you occasionally peep in to check up on the kids. The surf to play in, the sand between your toes, and countless things that wash ashore are some of the things that make the beach a great place to take the family on vacation. But just like most outings, a little planning and the right equipment can make a family beach experience all that more enjoyable. The beach is amazing, but no one likes being sun and wind burned. Who wants to leave your cooler in the sun so all the ice melts before you are ready to go home? One of the things that can make your stay more enjoyable and your skin less burned is a beach tent. They offer better protection from sun and wind than the old fashioned beach umbrella, and with optional anchors firmly embedded in the sand; you will not spend half the day chasing that umbrella. There are many brands and designs to choose from, so the selection process can leave you scratching your head. These tents come in all sizes and many different shapes and the colors are endless. To help you make an informed decision, here are four of the best rated beach tents that are worth a second look. 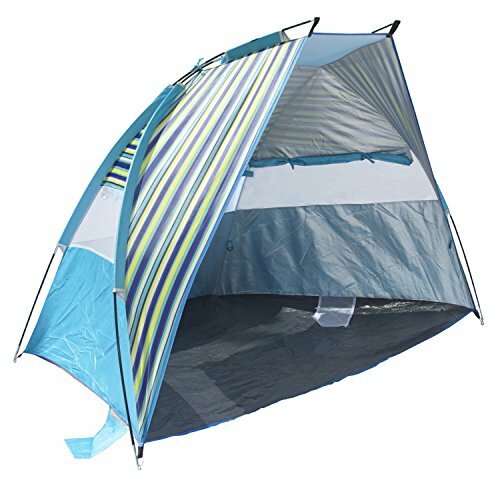 The Pacific Breeze Easy Up Beach Tent is super light and compact. It is easy to carry around thanks to its lightweight fiberglass frame and with its three step setup you are sheltered in seconds. It provides great protection from the elements including rain. It features large windows to catch that sweet sea breeze and a waterproof floor to keep everything in the tent dry. One of the handiest features is the internal pockets that are just right for sunscreen and other beach essentials. 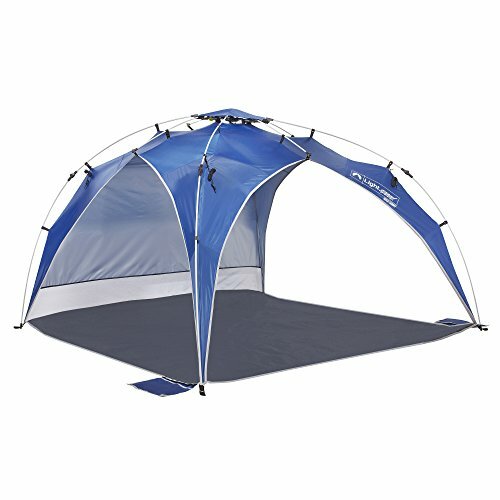 This tent is great for two adults and all their gear. It also provides a protected area for the children to rest in. The really great part about this little tent is the excellent customer service that comes with it and the one year limited warranty if you ever have a problem. The tent could be improved by installing a flap so it would not have to be moved when the sun changes direction. All in all, this is one of the best rated beach tents in the market and is well worth the money. 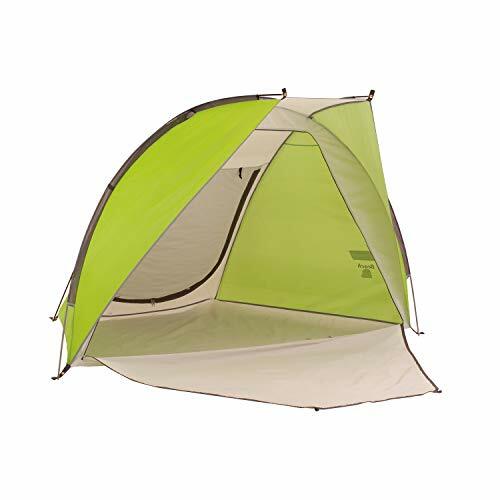 The Texsport Calypso Beach Tent is only slightly smaller than its competitors and easily one of the least expensive tents out there. Even more appealing is that it’s easy to set up so you can start enjoying the shade and quickly get your beach day underway. This sweet little tent comes complete with shock-corded fiberglass poles, a durable polyethylene floor and mesh windows that won’t let the mosquitoes in. It also features zippered storm flaps which can come in handy if the wind picks up. The whole tent is covered with silver coating for increased UV protection and heat repelling. It also has stakes and sand bags to keep the tent anchored and stable in the wind. The tent is rather small for adults, but if you have children that need protection from sun and wind, this is a good choice. Texsport Calypso Cabana fits perfectly in a beach, park and even public event environment. 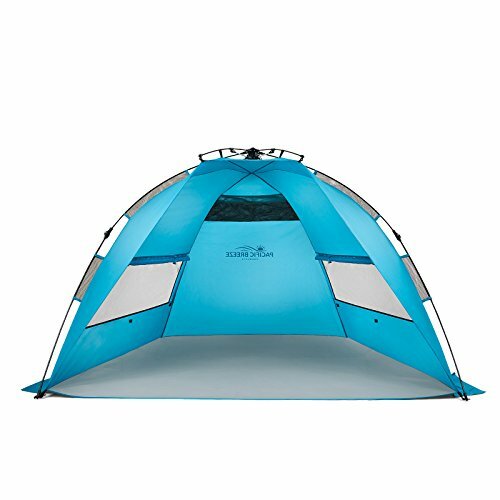 Although its features are almost ideal and it’s a great value, there are a few things to keep in mind with this tent. As the tent is very reliant on the direction of the sun, it does mean that the position of the sun greatly changes your view of the beach as the sun should be always behind your back to get full coverage. Some users have mentioned that the carrying case is too tight which makes it difficult to pack up the tent properly. Only a few minor issues, but all in all a great beach tent for the price . For a larger group, the Lightspeed Canopy Tent is an excellent choice. This canopy will accommodate four adults, their chairs, and other beach essentials comfortably. It is really easy to set up because of its innovative Built-in Pole and Hub System. It comes with carrying case, sand pockets, stakes and guylines. The carrying case also sports a shoulder strap which makes it easier to carry around. This canopy tent will hold up in the wind thanks to its strong support polls. The shape of the tent helps the wind flow over the top, making the tent stand firmly on the ground. The tent provides shade and with side walls closed the position of the sun won’t matter too much. With the large mesh window in the back you are able to see what is happening from all angles. Although a bit pricier than its competitors, this is an excellent choice and easily makes our list of the best rated beach tents. Available in many different color variations, the Coleman Beach Shade is a worthy option when searching for the best beach tent. If your need is privacy as well as shade, you can’t go wrong with this option. It has space for all the essentials that one would need in a beach environment and you can have trust in the Coleman brand. It’s also very easy to carry around in the carrying case and isn’t a huge hassle to get setup. There is a floor mat that extends out from the interior which is a nice feature. The tent is covered with a material that protects you from the UV rays and the extra long stakes make it more stable so it will not fly off with the wind. If you are looking for a beach tent that is priced competitively and comes with a trusted brand name, you really can’t go wrong with this Coleman Beach Shade for the casual beach-goer.